Earlier this year we were all surprised by the brilliant Instant Family, a film that managed to mix comedy and drama together in a way we had rarely seen before. Now a film has managed a similar feat. It would be so easy for most people to see a trailer for Fighting With My Family and seeing the fact that it seems to mix comedy and wrestling and decide to avoid it like the plague. Doing that though means you will be missing out on one of the best films of 2019. 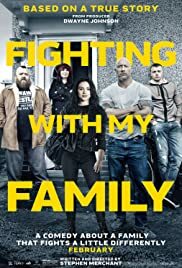 Fighting With My Family is the biographical story of one of WWE best female wrestlers Paige, whose real name is Saraya Knight (Florence Pugh – The Commuter, Lady Macbeth). Coming from a wrestling family in England saw Saraya training and actually wrestling with her parents – Ricky (Nick Frost – Shaun Of The Dead, Attack The Block) and Julia (Lena Headey – Game Of Thrones, Dredd) for her whole life. Working as a double act both she and her brother, Zak (Jack Lowden – Dunkirk, Calibre) dream of making it to the WWE alongside the likes of The Rock (Dwayne Johnson – San Andreas, Jumanji: Welcome To The Jungle). When the WWE comes to England both Zak and Paige head for the try-outs where they discover that the man that will decide their future is the gruff Hutch (Vince Vaughn – Old School, Couples Retreat). Even on paper the story sounds pencil thin but due to a great screenplay from director/writer Stephan Merchant (The Office, Life’s Too Short) the film itself is absolutely captivating. Yes Merchant uses the comedy stylings of his cast to full effect, but there is no way you could ever call the film an outrageous comedy. Merchant instead has created a film with complete heart as it follows a family trying to live their dream against all the nods and smatters it here and there with great one-liners that stick with you long after the credits has rolled. Merchant brings out the absolute best in his cast. This is the film that shows that Florence Pugh has a huge Hollywood career ahead of her. Her performance is balanced and she handles the dramatic moments along with the physical side of the role as well. Pugh is a general acting sensation and she is well backed up by likes of Frost and Vaughn. Frost could have easily gone into comedy overdrive here but instead he weights his performance with drama as well. His character is a gentle giant with a rough past and you can tell that Frost has put his heart-and-soul into the role, he even manages to match the dramatic style of Lena Headey… no mean feat at all. Likewise Vaughn brings his A-Game to a film that many actors would have tried to breeze through. With recent films like Dragged Across Concrete and Hacksaw Ridge showing Vaughn’s strong presence in a dramatic role he once re-creates that here and lifts his character from your usual ‘mentor’ role. He steals nearly every scene he is in and the revelation about his character is one of the highlights of the film. Fighting With My Family is the kind of movie that will become a favourite film for a lot of people right around the world. You do not need to be a wrestling fan to fall in love with this film. Like films such as Billy Elliott this is a movie about dreams and it is a film that filled with heart and interesting characters that you can’t help but fall in love with and want to see succeed. The film mixes the right blend of true emotion, drama and comedy while Merchant is skilled enough to bring the best out of his cast. Pugh, Vaughn and Frost are sensational while Dwayne Johnson laps up the opportunity to finally combine with his alter ego on the big screen. Fighting With My Family is a film not to be missed.